This winter has seen nothing but one wave after another of cold, ice, and snow, to the point that I haven’t been able to actually see the garden at all over the past couple months. 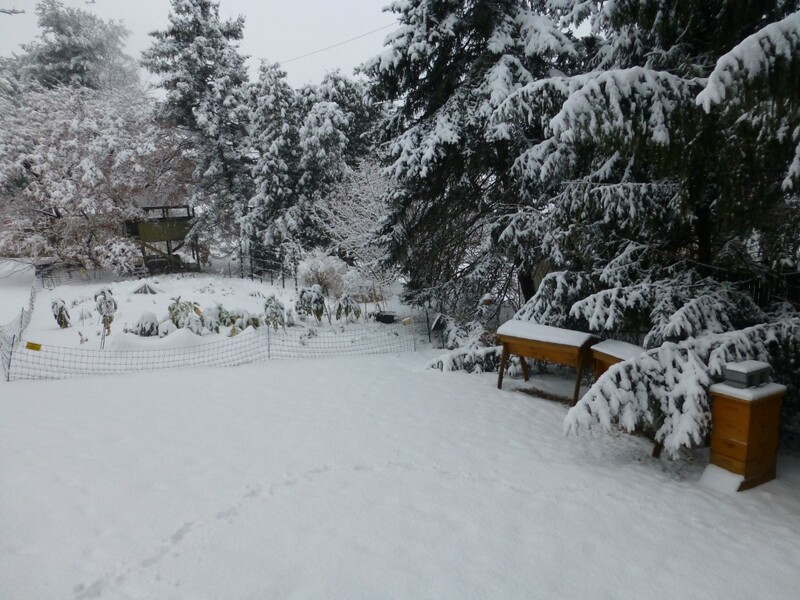 That’s not entirely bad as the consistent snow cover provided insulation and will help protect over wintering plants from the bitter cold and biting winds. The coming week’s weather forecasts and rising temperatures provide hope for the reappearance of both Spring and the garden. In the meantime I thought I’d post some pics from the fall season and the last time that I could actually enjoy the garden. But first up is a photo that sums up what the winter has been like here in Central Pennsylvania over the past few months. That picture shows just what the winter has been like, and most of us are ready for it to end and a new gardening season to begin! 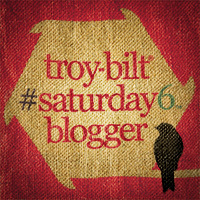 Until then let’s take a stroll through last fall’s vegetable garden. 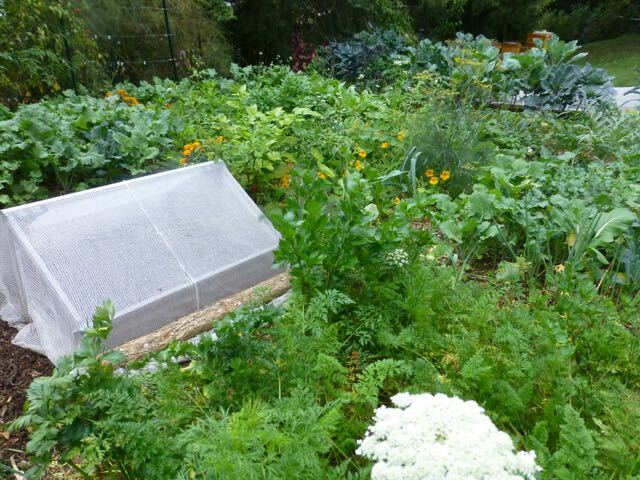 October seems so long ago but here is a pic of the fall vegetable garden showing how lush and green things were as the fall growing season wound down. It would be a shame to stop gardening because summer had ended and miss out on all that the fall season has to offer! 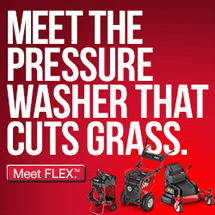 It isn’t just the hardy plants that can take advantage of the fall months. 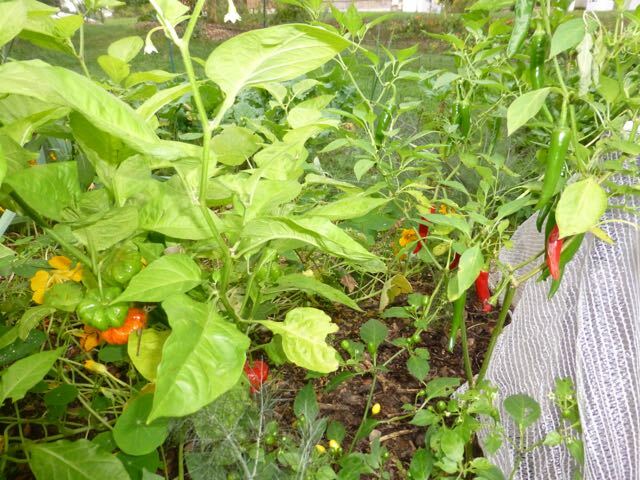 Here are some pepper plants that continued to ripen their spicy fruits. I usually pot some of the plants to bring indoors before the first frosts arrive. You might not expect turmeric and ginger plants to grow well in the North even during the summer, but these plants haven’t seemed to notice the change in the seasons and kept right on growing even as the days turned colder and shorter. The tomato plants lasted longer than usual, so I just pruned the lower branches and planted leafy greens underneath the plants. Sweet potato vines were also rambling along the ground like it was still summertime. 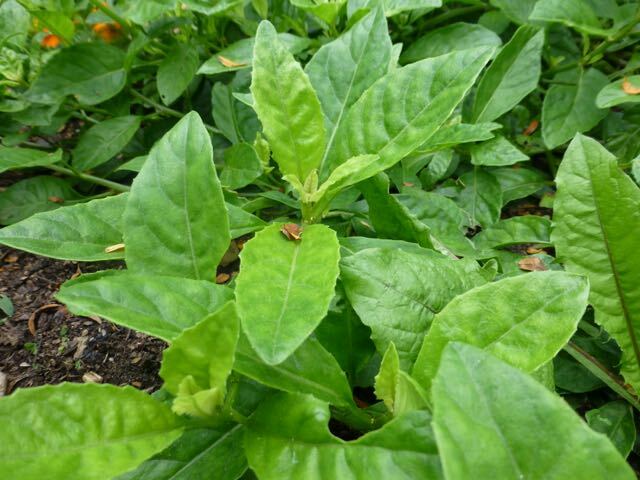 Okinawa Spinach was a new crop for me last year and it turned out to be my most productive leafy green vegetable as two plants covered a section of one bed that was about seven feet by four feet with mild and delicious greens lasting all summer and into the fall months. 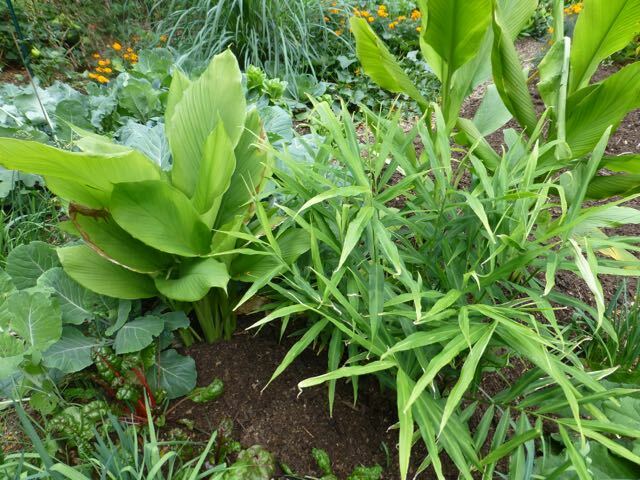 Here is a picture of a Lovage plant and the Turkish Rocket perennial plants that grow alongside of it. 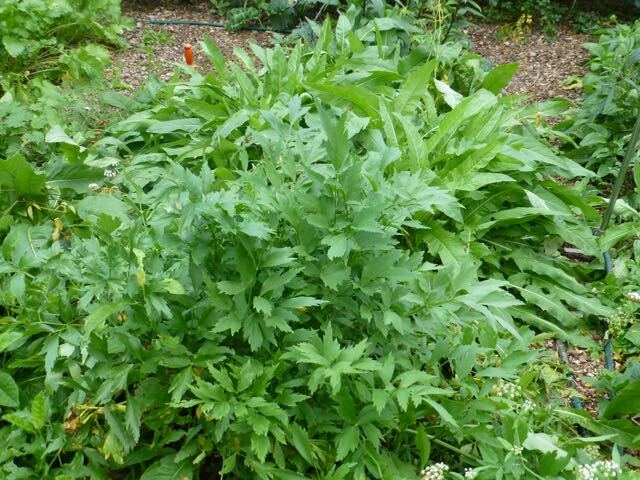 A little of the strong flavored Lovage will go a long way in the kitchen and the Rocket returns each year to produce a ton of leafy greens with no maintenance. 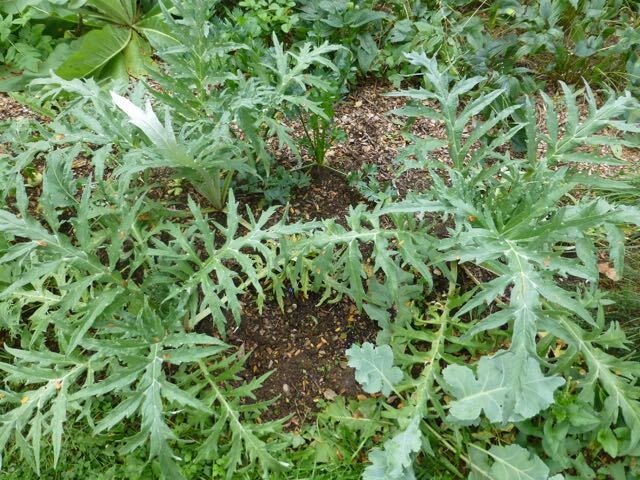 The Globe Artichokes struggled through the heat and drought of summer but recovered nicely as fall arrived. Whether they will survive the winter and live to see springtime is a different story altogether. 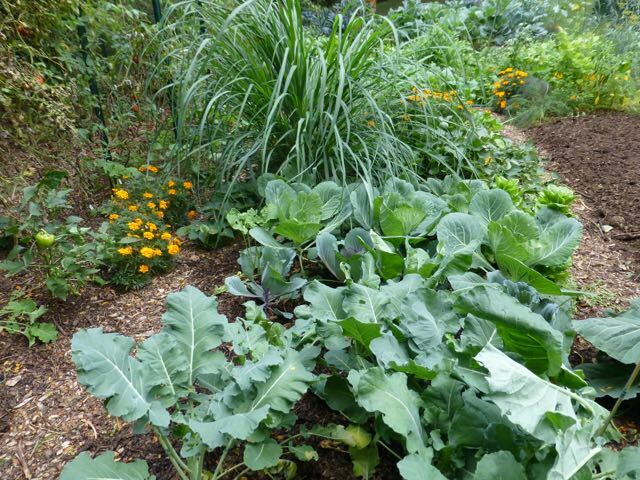 This is a bed of broccoli, cabbages, collard, and kale varieties growing in the shadow of a huge Lemon Grass plant. The Lemongrass was living on borrowed time and didn’t survive an early frost, but the hardy brassica plants kept growing deep into the fall season. I love this Ole Timey Blue Collard variety but the seed is difficult to locate and my own supply is growing low so this may become a project to save seed from this variety to ensure that it is around for planting in future seasons. 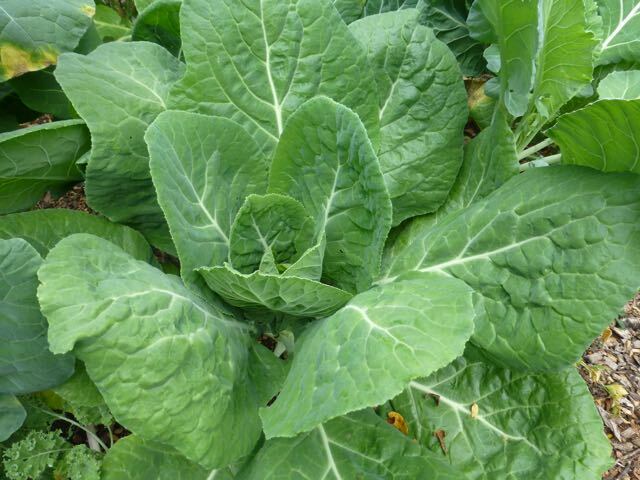 Collards are great for their versatility and ability to grow through heat or cold weather. Here is another attractive collard strain. They will produce tasty greens from spring through fall and can over winter to yield into the following year. 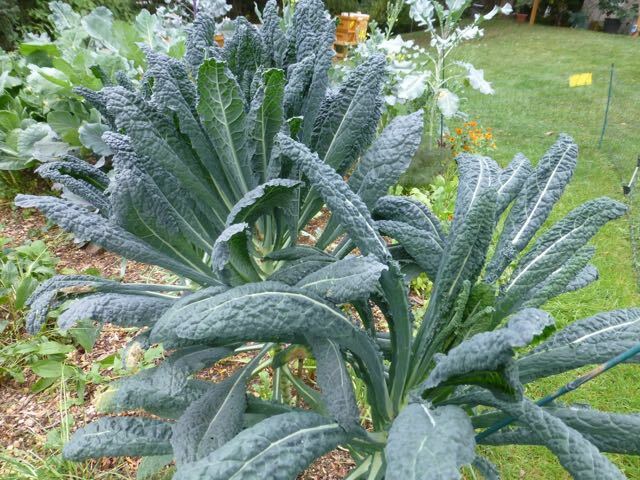 Palm Kale used to be one of those varieties that you had to grow yourself in order to enjoy it. These days I see it at markets and even on commercial grocery shelves, but there is still no comparison to what you can harvest fresh from your own backyard. 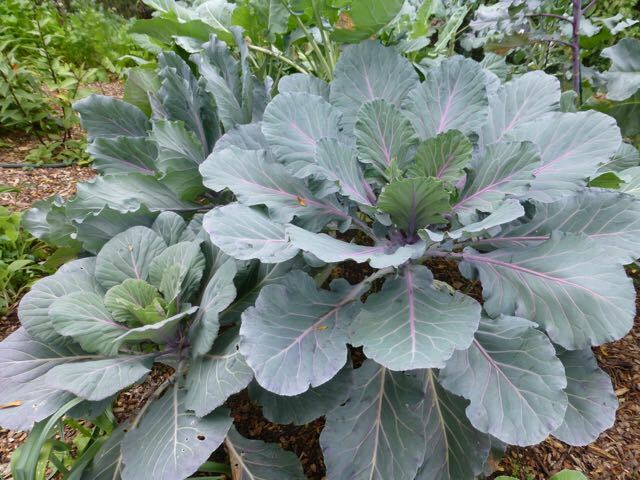 And to have something more unique you can grow this purple strain of Palm Kale that adds color and a slightly different texture and leaf shape from that of the dark green strain that has gone main stream. Now back to reality and the snow that still covers the garden. 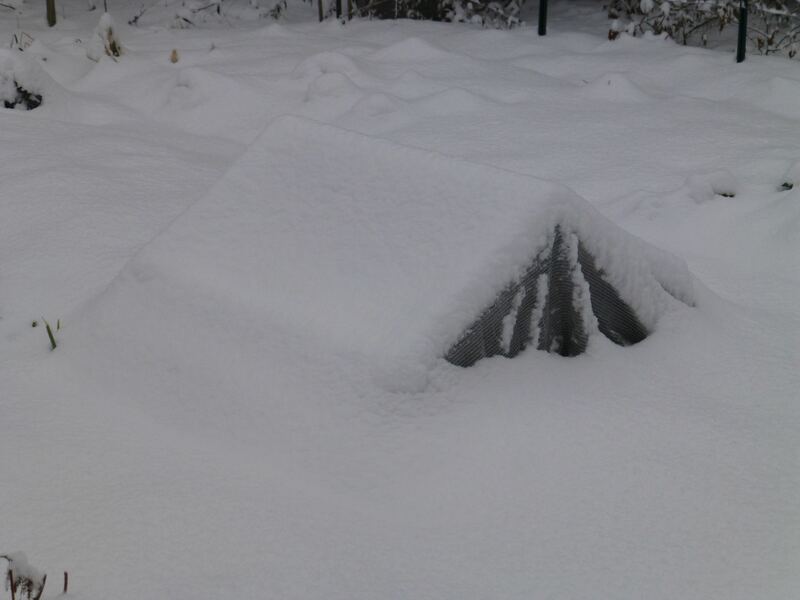 Here is a cold frame buried in the snow but containing hardy greens that will hopefully thaw out and begin growing any day now as the snow melts, temperatures rise, and Spring makes a welcomed reappearance! That’s definitely a sight for sore eyes! I still have 2’+ in my yard up here in Boston and I aim to plant Fava or peas on March 21! Please tell me where you got your Ethiopian spinach. Also, do you have success with any shaded fall plants? I have 6-7 hours of direct sun on most of my back yard. My garden is still snowed in but the front yard has reappeared! Baker Creek Heirloom Seeds sells starts of the Ethiopian Spinach, it is a great plant and I was able to take cuttings in the fall to over winter indoors and it seems to be doing fine until I can get it back in the ground. I may have the name wrong because they have it listed as Longevity Spinach which is green, and Okinawa Spinach which has a reddish accent to the leaves. I grew both varieties and they are very similar. 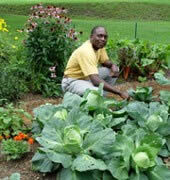 Leafy greens; kale, collards, mustard, lettuce, etc. should do fine for you with that amount of light… even a sunny garden has to deal with less light as fall and winter arrive. Your garden looked like an edible paradise. I’m making a note to investigate Ethiopian spinach. Last year I grew Malabar spinach and it renewed my interest in unusual greens. Thanks Mark, Malabar spinach is another leafy vegetable that I also enjoy growing. Have raised both the green and red varieties and I like the vine-like growth and the unusual texture of the leaves. Absolutely gorgeous. 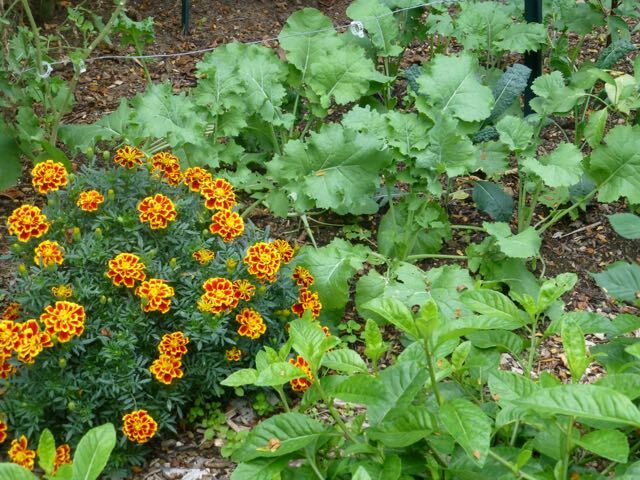 I really like the use of companion planting with the french marigolds by the leafy greens. 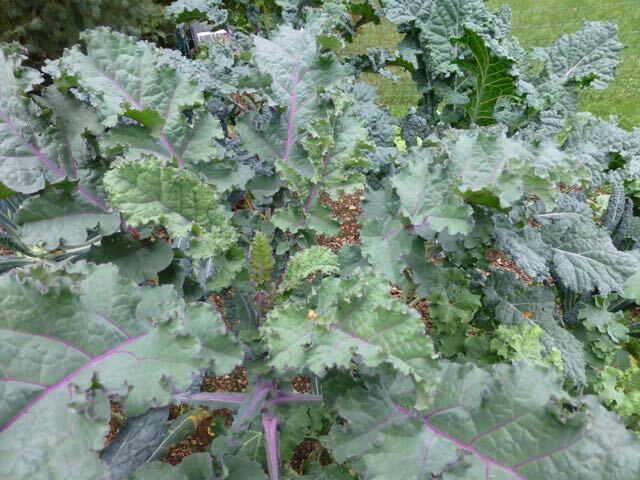 Have you or anyone else had particular success with a certain variety of kale with the cold and long winters? Coming from the UK I’m used to the green curly and calvalo nero varieties but I’d love to try the reds. Incredible garden! Not sure where you found that Palm Kale but it really caught my eye. I pick up my seeds from sustainableseedco.com. They have so many heirloom and organic seeds to choose from. Do you have a preferred place where you buy your seeds?